I love Christmas time cocktails, and this is one of my FAVORITE things to make! This Bloody Mary Vodka makes for gorgeous holiday gifts. You can pretty much use what you have on hand. 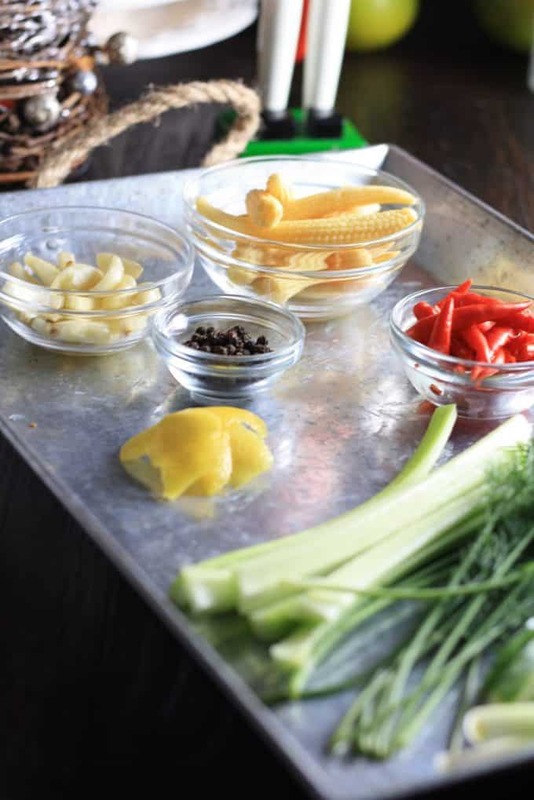 I like my bloody mary’s to be a little on the spicy side, so my infusion ingredients included peppercorn, spicy red chili peppers, whole garlic cloves, baby corn, fresh dill, green onion, cucumber slices, lemon peel, and celery. Some ideas to make your own Bloody Mary Infused Vodka! I used cheap a bottle of cheap vodka, but if you have a more refined palette, I’d suggest Kirkland Brand Vodka- rumor has it it’s really Grey Goose! 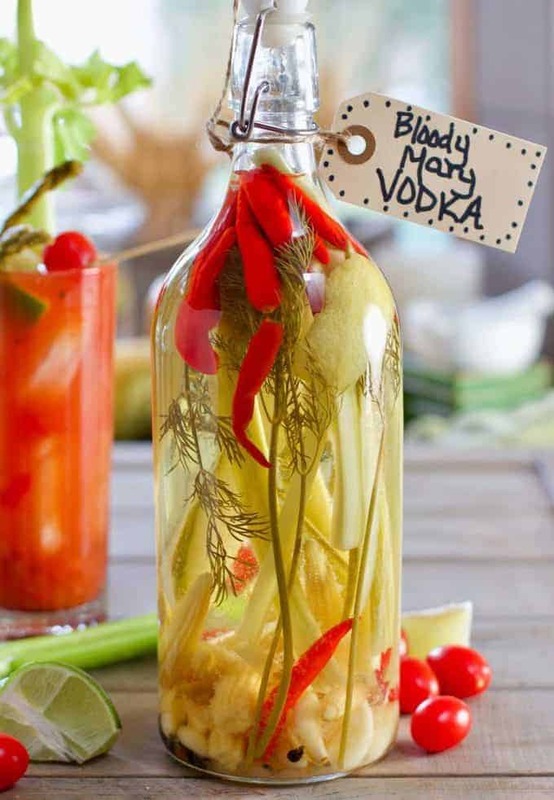 A few tips to make Bloody Mary Infused Vodka! Wash your veggies really well! I didn’t do this and it made my batch a little cloudy (still drinkable, but cloudy). 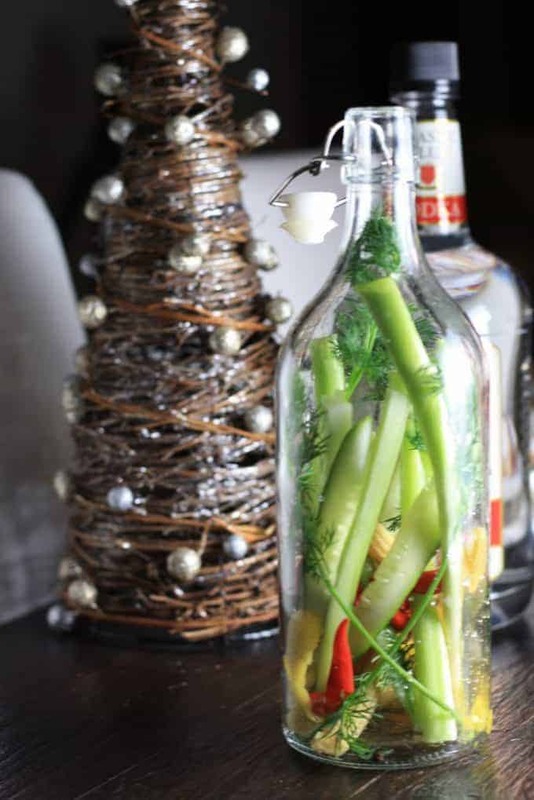 The bright colors of the veggies are so gorgeous in this bottle (be warned- they will fade a bit from the alcohol though) and they really compliment a nice pretty red ribbon. Add 2 shots of vodka to ice, a dash of tomato juice, some horseradish, and stir with a freshly sliced stick of celery. 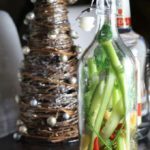 An easy to make infused vodka- Great for gifts, perfect for brunches, and simply yummy just on it's own! 1 Glass Bottle Tip- Use wide mouth bottle to scoop infused veggies out into drink! Lemon Rind I peeled 1 whole lemon rind for this and it was great! Vodka I used Classic Club brand- use equivalent ounces to suit your bottle. Rinse bottle well- Let dry completely. Add all veggies to washed and dried bottle, pour vodka into bottle, and let sit for at least 24 hours before serving. Use within 2 weeks.